Okay, so I'll go back to December 23. That's the day that Sylvie decided to be a broody hen. Sylvie is on the left and Lady Grey is on the right. 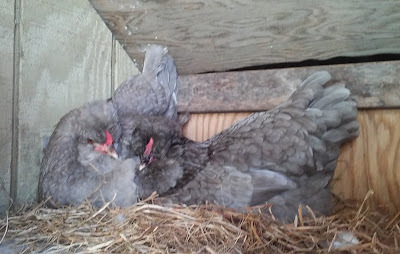 Eventually they decided to co-mother, and they went broody together. If fertilized eggs began being set on December 23, they should hatch 21 days later, or on January 13, the day of my daddy's funeral. Needless to say, I was long gone to West Virginia by that time, and baby chicks were the last thing on my mind. Honestly, I didn't think any of the eggs were fertilized. I hadn't seen either Bernie or Arthur pay any attention to their hens of late. I was willing to have Sylvie (and later Lady Grey) set on eggs because I wanted them to be broody. 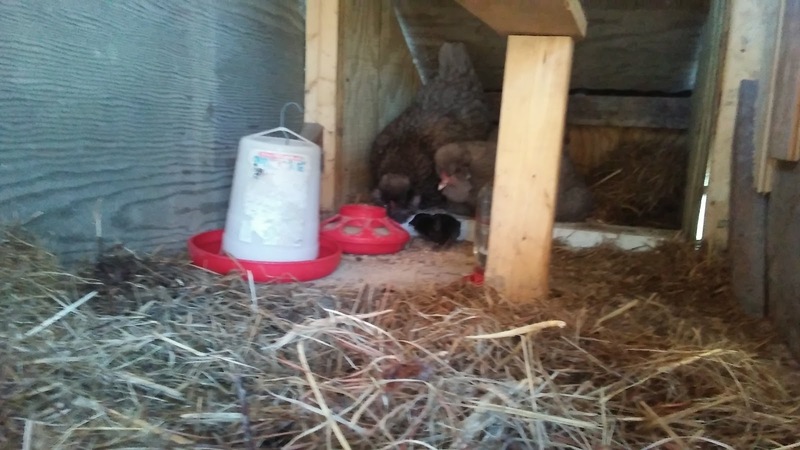 I wanted broody hens in April. I figured when I came home after the funeral, I'd take them off those tired, old eggs, and we'd call ourselves done. I returned from West Virginia yesterday evening. Adam had lifted both hens from the nesting box on Monday, and seen 4 eggs. I found one of the eggs rejected (one of Ethel's eggs from the other flock). 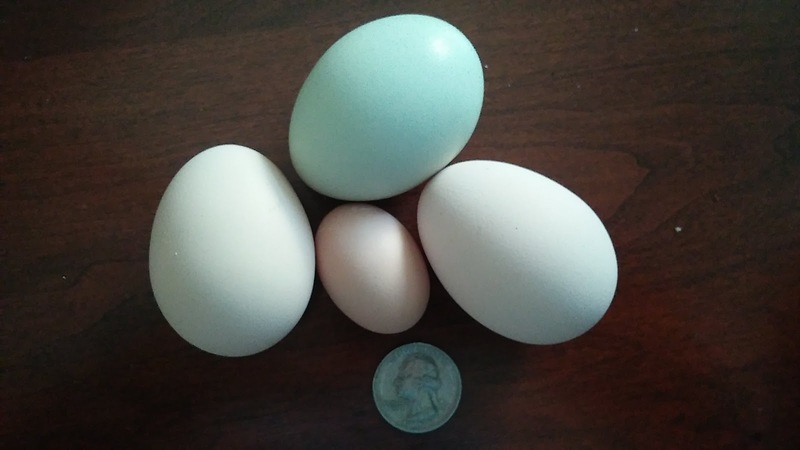 So on Monday morning, there were 3 green eggs under those hens. The green egg above is Autumn Hen's egg. I put some of hers under the 2 broody hens. 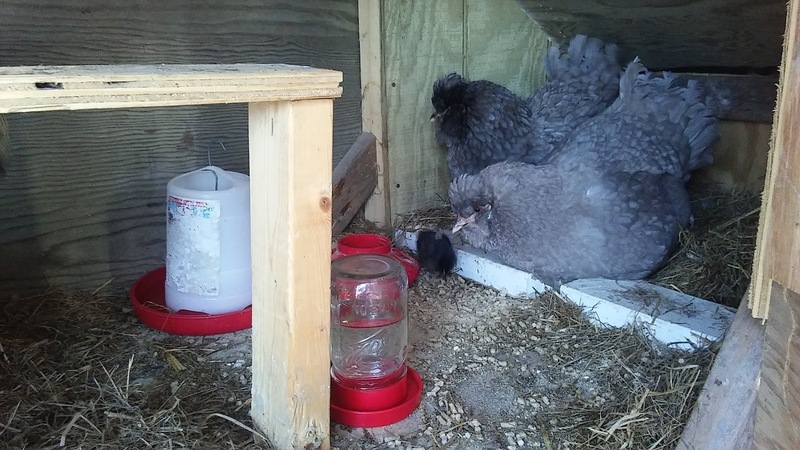 In the end, the broody silkie hens rejected their own eggs because they weren't fertilized. But Autumn's eggs were kept and set upon because Autumn is Rooster Arthur's favorite hen -- so her eggs are fertilized! This morning, quite unsuspecting, I found three baby chicks in the coop, peeking under their two broody mamas! Can you see the little one? The mamas are very protective. Sylvie pecked my hand. There are three of them, all black, like their daddy. They were not there on Monday, so they were born sometime Tuesday, January 16. I am thrilled, of course! I did not expect chicks this time of year, from such a young roo and young hens. With two mamas, the chicks have a good chance of survival against cold, and they take care of all the instructions - how to eat, how to drink, where to hide. Arthur went in today to see his babies. He seemed pleased. For the first time, I've had success in increasing my flock - finally!